Bloons has been around for years, originally starting as a small Flash game which I remember fondly trying to sneakily play while I was meant to be doing work on the computer at school. 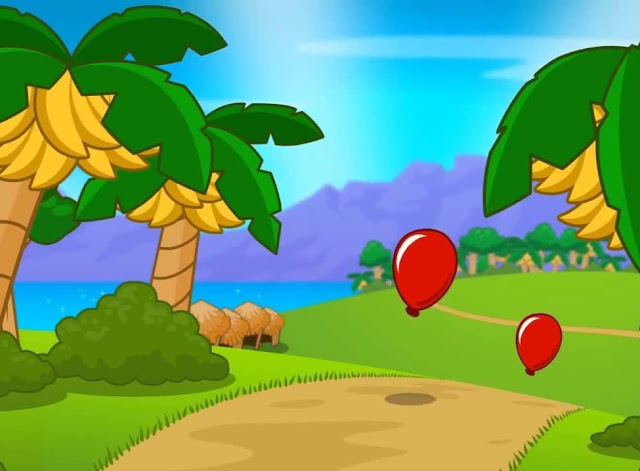 Much like the countless of tower defence games well before it, and many that it inspired, Bloons’ concept is a simple as it is addictive; it's all about monkeys attacking wave after wave of balloons. Bloons TD 5 is actually currently available to play for free on the Internet, sticking to its roots as a flash title. It’s now available on consoles for the first time, and its jump to the big screen hasn’t lost any of the charm from its flash counterpart. Unfortunately, this also wasn't a game that was ever meant to be played on really big screens. 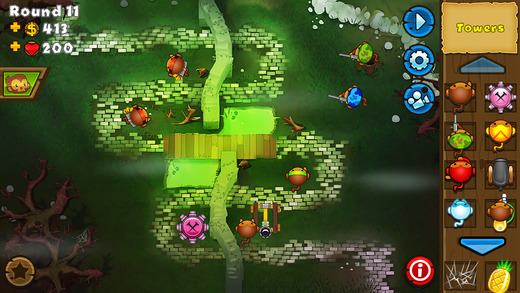 Like all tower defence games, units (in this case balloons), move from one or more entry points on a path to the end of the map. These maps can vary from simple paths or twisty tracks full with bridges and hidden sections underground. 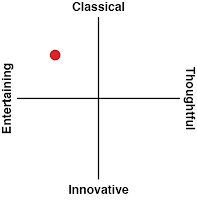 The maps are diverse enough to keep the game interesting, and if at any point the game gets boring, a new map will freshen the game and give it some new life, admittedly even if it's just a short period of time. It’s the job of some deadly weapon wielding monkeys to put a stop to these balloons, popping them before they get the chance to float to the end of the map. After a few waves things get interesting, balloons start appearing inside other balloons, some will be invisible and immune to weapons that your army of monkeys use. Your first unit starts off as a monkey with a dart blowgun. He’s effective at taking out balloons one by one, but as the waves start to speed up it’s not as effective as the earlier rounds. You slowly build you arsenal, sniper monkeys who can attack balloons no matter where they are on the map, ninja monkeys who can see invisible balloons, and monkeys who freeze balloons, slowing them down to give you some much needed breathing room. Each monkey has a skill progression tree, which may increase their range or their power - stock standard tower defence mechanics. Normally, it would be an effective means of creating a sense of difficulty, the careful strategic placement of towers to prevent balloons from getting through to the end of the map. This is what the game encourages, yet playing the game on any difficulty simply means spamming as many towers as possible to destroy as many balloons as possible. Units can be bought and upgraded with gold, which is accumulated through the completion of waves. As with any game that can be played in the very Internet browser that you’d currently reading this on, Bloons can get repetitive. Every map has its waves planned out. You will see the same balloons in the same round, which is beneficial if you want to strategise to complete the map on the hardest difficulty, but if you’re looking for a new challenge you won’t find it in playing the map again. There is the addition of missions, which will provide you with a different set of challenges should you grow tired of the tower defence formula. 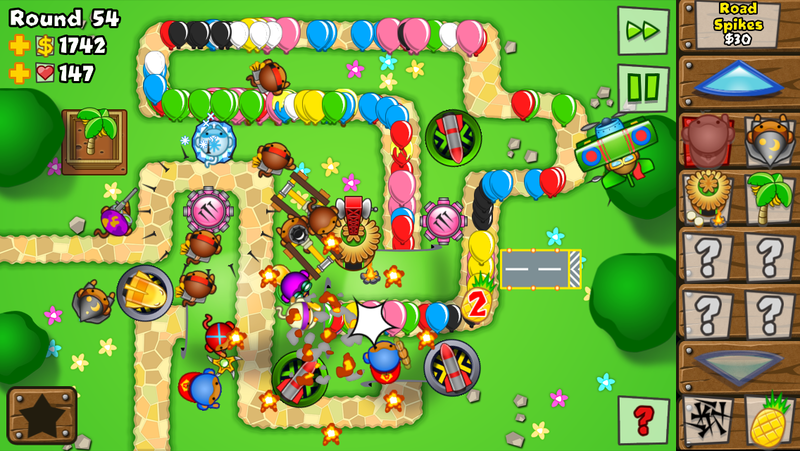 I struggle to see the purpose and effectiveness of putting Bloons TD 5 on consoles. It’s not necessarily the game that benefits from the implementation of a controller, and it doesn't really benefit from the big screen experience. Nonetheless, Bloons is an enjoyable time-waster for 10 minutes, when you’re wanting a bit of break in-between other games. 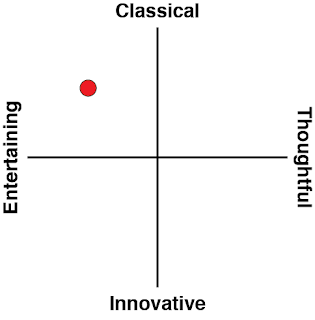 In short, it's a great formula for pick up and play, regardless of the platform its on.